Magic Carpet Cleaning is London based company, which provides best quality cleaning services. We use modern and advanced cleaning tools to achieve perfect results every single time. All of our cleaners are vetted and certified. We have 100% satisfaction guarantee or we re-clean for free. Fell free to call us for more information. Be sure your carpet will be as good as new, by using most recommended methods – dry powder and deep steam cleaning. Unlike general belief, domestic methods are not enough to achieve a clean carpet. Using detergents and carpet cleaning powders do not thoroughly kill the bacteria and remove the dirt in your carpet. Magic London Carpet Cleaning in Dulwich SE22 offers a wide range of carpet cleaning services that guarantees germ-free and stainless carpets for your home or office. We use the most advanced techniques using the most effective carpet cleaning materials to remove all traces of stains and bacteria from your carpet. We offer various carpet cleaning techniques, from dry cleaning to steam cleaning. Our Dulwich SE22 carpet cleaners are all fully qualified, vetted and experienced. They are friendly and courteous and strive to deliver the fastest, most effective and best quality cleaning service. If you’d like to know more about our carpet cleaning services as well as to book a cleaning service, please do not hesitate to contact us today! Our customer support is 24/7 available for your convenience. 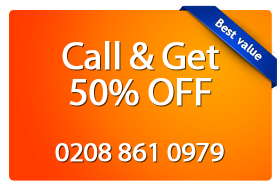 Just Call 0208 861 0979 and you will get a free estimate. Also you can use our on-line booking form.